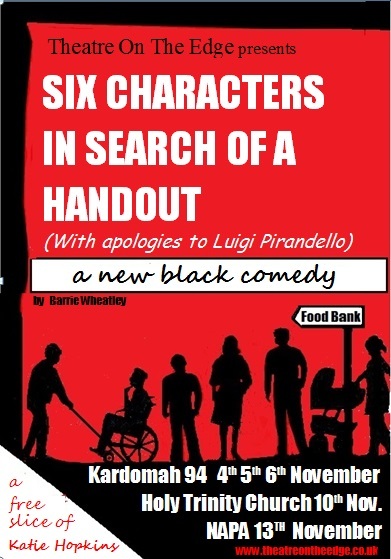 Theatre On The Edge have launched their latest production called Six Characters In Search Of A Handout at Kardomah 94. This new black comedy is an outstanding piece of theatre with laughs, confrontation, guts and an unflinching genuine quality at its heart. Dealing with a very hot subject that is very capable of blowing up if done wrongly, this production with a quality cast presents extremely well with six ‘Characters’ (real life people) asking six ‘actors’ (played by actors) to tell their real life stories of meeting at a food bank and how they ended up there. The reality of the stories and the acting of them is hard to tell apart in a blissfully excellent way which moves the story along at a fantastic pace and also seems to explain some of the myths about the reputation of modern theatre in this day and age after careful cultivation over many centuries. With a cast of 12 handling a really hot brick it would have been very easy for writer/director Barrie Wheatley to go down the political route and bash the Conservative government from pillar to the post due to the explosion of uses of food banks but it doesn’t. It is also pleasantly noted that no one character dominates and the dynamic changes around as each character is explored in depth but for exactly the right amount of time to explain their personal story. The cast of Molly Robinson, Maxwell Smales, Sara Featherstone, Dave Bush, Clare Crowther, Jamie Wilks, Kirsty Old, Ella Straub, Stan Haywood, Chris Gruca, Jackie Rogers and Katy Burgess are expertly pitched and perfectly suited to their parts. The main strength comes from Arnold (Haywood) and Katie (Burgess) as the latter arrives last on the stage and gives a whole different dynamic with her ruthless treatment of the ‘Characters’ and is eventually taught a harsh lesson by the messed up but meaningful and charming older man. With a political undercurrent which is perfectly handled by the wonderful cast who never allow it to takeover the proceedings this is very powerful storytelling at its finest with breathtaking control of a very difficult subject without creating a pervading scandal. There is also an appeal to give to a collection for organisations that help to fight against food poverty with donations of Tinned food, Packets of food or money. The production is on at Kardomah 94 on 5th and 6th November, Holy Trinity Church on 10th November and Northern Academy of Performing Arts (NAPA) on Anlaby Road on 13th November tickets are £7 each at Kardomah 94, £5 each at Holy Trinity Church and £7/£5 at NAPA on the door at either venue. The penultimate day in Paris. Martin and I decided to start with a trip to Notre Dame, it’s a massively imposing building and leaves you with a crick in your neck from looking up all the time. We took about an hour to walk round the cathedral and take several photos. It is a truly stunning place and, once again, it is a place that I am very pleased to have visited and I will gladly go back there at some point in the future. It certainly puts Holy Trinity, which I live near, into perspective just because of the sheer size and detail of it. We left the cathedral and went back across to Shakespeare and Company because I had only looked round downstairs last night so today I wanted to look at the upstairs. Looking upstairs is quite a thrill because you see where writer’s who are invited to stay there actually sleep. There is also a personal library full of books which you can read but are not for sale at any price. We walked the long distance back to the hotel, which took longer than we expected because we thought we were only about 2 miles away from the hotel. After we’d had lunch I took my medication and fell asleep for a few hours, after this we decided to go and do the last bit of sightseeing by going for tea and then going to The Louvre art gallery. The Louvre is massive and in the hour and a half we had there we only scratched the surface but having seen the Monna Lisa that was the part that I really wanted to see and we saw lot’s more Italian art and also Spanish art and Thomas Gainsborough also has a display there. We took many photos again as we went round and it is certainly a place that I will have to go back to because it is a place that I could easily spend a whole day in. Speaking to Lynda Hill, who compiled the above named book, you get a sense of just how much the fab four from Liverpool still mean to her now. With a smile on her face and a glint in her eye in the magnificent surroundings of Holy Trinity Church it’s plain to see that she has a great enthusiasm for the band that has seemingly stood the test of time and passed it with flying colours. The front cover of the book carries a picture of Lynda with the band. She explains to me that the photo was taken at The ABC on 24th November 1963 and goes on to say that they visited Hull 4 times. She says “The book is my story about me and The Beatles. But not only that, it’s also the stories of other fans who had a connection to the band or other related experiences. She continues “It’s about 1 city, 2 venues and 4 appearances. They had 2 performances at the Majestic Ballroom and 2 appearances at The ABC. The book was released on 20th September and Lynda did book signings in WH Smith in the Prospect Centre and at Waterstones on Jameson Street in the town centre. The book can be bought at either of those outlets or directly via Facebook by sending a message to Lynda Hill personally or to her alternative page on there called All You Need is Hull The Beatles and Me- Book. She also tells me about how, at the event last year marking fifty years since The Beatles had been at The ABC, she stood in St. Stephen’s on the exact same spot where she had stood fifty years before, when it was The ABC, at exactly the same time. I also learned from her about how people from as far flung places as South America, Russia, Australia, Canada, Italy and Greece have ordered the book from her via Facebook..
Lynda is obviously a very genuinely heartwarming lady who recounts certain experiences she had with The Beatles with great zest, but don’t just take my word for it, buy her book and I’m sure you’ll also see her enthusiasm shining back at you. Thousands of Christmas shoppers were treated to another magical Live Nativity this afternoon. Flash mobs at St. Stephen’s and Princes Quay shopping centre’s surprised shoppers with impromptu performances that gave a new modern twist to the nativity story while other performers from NAPA took the parts of Mary, Joseph, shepherds and the three king’s. With 2 donkey’s involved as well the performers made their way through Hull Town Centre, along Whitefriargate all the way to Holy Trinity Church for another celebratory piece of music and dancing. Inside the church from 10 o clock in the morning was Trinity Open Market with several stalls doing a strong trade in gifts such as pictures, books and many other items all set in the magnificent surroundings of the church along with its Christmas Tree and decorations and nativity scene. After the massive success of the recent Victorian Christmas Market trader Julie Buffey was once again involved with this market event and said that trade was going well again. Outside the church in the afternoon there was Christmas Carol singing from the NAPA Choir before the live nativity arrived. After the live nativity performance outside the church there was a candlelit service inside with all the lights off and many Christingle’s burning brightly with the live nativity, including the donkey’s, having made their way to the front of the church. All in all the event again seemed to be very well run and was obviously another big hit with hundreds of people gathering outside the church for the arrival and performance of the live nativity, and many also taking places in the church for the candlelit service.